There has always been an element of suspension of disbelief with the Jurassic Park films even with the hubris-pushing premise, but the sequels specifically have had to manage a rising tide of incredulity and sense of dumb. You can only keep going back to a dinosaur-infested island or thinking this time mucking with the DNA of large, extinct, highly advanced killing machines will be different. Jurassic World: Fallen Kingdom may be the dumbest yet, and while it does have moments of fun and excitement, the dumb outweighs all else. Years after the deadly attacks at Jurassic World, the volcano on the island has reactivated and the remaining dinosaurs are in imminent danger of another extinction (except for the flying ones, but whatever). Claire (Bryce Dallas Howard), with sensible footwear this go-round, is looking to raise money and awareness to save the thunder lizards. 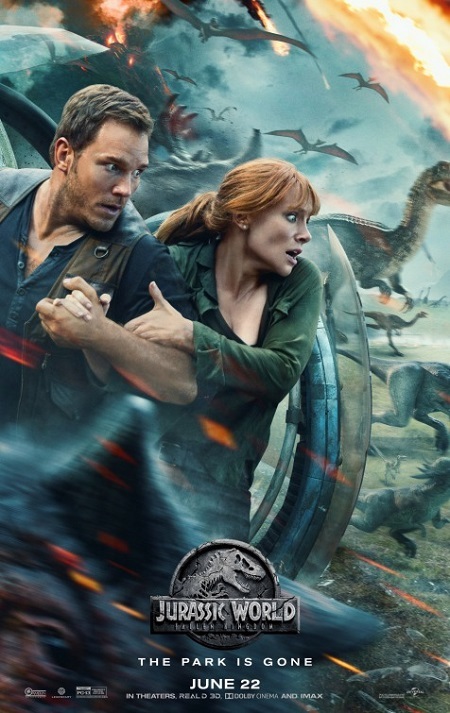 A wealthy magnate (James Cromwell) wants to save the dinosaurs and whisk them to a wildlife preserve far from mankind, but first they must secure the raptor Blue and in order for that to happen, Claire needs to convince her former flame and co-worker Owen (Chris Pratt) to go back. They venture back to the endangered island only to run into more trouble from stampeding dinosaurs, new super predators, and a plot to house and sell the creatures off the island. Maybe it’s just a side effect of being the fifth movie in a generation-spanning franchise, or maybe it’s a holdover effect of the 2015 film’s meta-commentary about audiences becoming complacent with what used to inspire awe, but it feels like returning screenwriters Colin Trevorrow (The Book of Henry) and Derek Connolly (Safety Not Guaranteed) couldn’t be bothered picking a tone or developing their plot. It reminds me of the seventh season of HBO’s Game of Thrones, specifically the back half of episodes. It felt like the creators had certain conclusions in mind and rather than smarty develop storylines that would naturally reach those conclusions, the “how” of the narrative became jumbled, confounding, and frustrating. 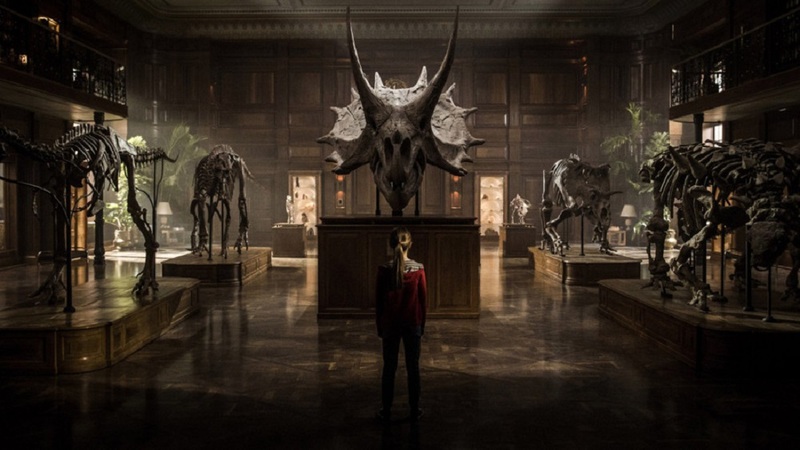 I felt the same way while watching Fallen Kingdom; the stylish set pieces were likely established first and foremost and the stuff in between, you know the story and characters and their interaction, was given far less attention. It didn’t matter how we got from one set piece to another. This lack of consideration leads to many moments that keep you from fully engaging with the movie, namely dumb and/or awful characters doing dumb things for dumb reasons. The conclusion of Fallen Kingdom seems meant to leverage interest in a third movie, which is already scheduled for release in 2021. Was this 128 minutes the best way to get there? When people repeatedly do stupid things, it tests your limits of empathy. This happens to me with horror movies and it happened for me with Fallen Kingdom. It’s the kind of movie where a little girl runs into her bedroom and hides under her covers from an approaching hungry dinosaur. The ensuing image of the stalking beast entering the bed with the claws is a killer image, but what did we lose getting here? This little girl was not established as some dumb kid either. The preceding hour showed her as resourceful and plucky, so this just erases all that. There’s another moment where characters have to choose between escaping through an ordinary door or an open window and crawling along the edge of the roof… and guess what they choose. This is the kind of movie where characters will be in danger and then, hooray, another character arrived in time to save the day, and then another character arrived to save the shortly-after next day. Then there’s a bad guy who enters a dinosaur cage simply to retrieve a dino tooth for his personal necklace of dinosaur teeth. I’ll repeat that. He’s not extracting them to sell to another bio-engineering company for its DNA (the opening scene presents this very example). He’s removing dinosaur teeth for his own personal decorative hobby. My preview screening groaned in unison loudly at how stupid all of this was. How am I supposed to even enjoy this dumb character’s inevitable death when they’re this dumb and undefined? The dumbest action of all is tied to its central premise of saving the dinosaurs. When Jeff Goldblum’s Ian Malcolm (relegated to a two-minute cameo, don’t expect much) was championing letting the dinosaurs go extinct again and the folly of mankind playing God in the realm of genetics, I was right with him, and I’m no GMO spook. Bringing gigantic, killing machines back to life was clearly a mistake as five movies have now shown in great, bloody detail. At some point a lesson must be learned. I know that Fallen Kingdom is meant to imbue the dinosaurs in an animal rights lens, with Claire trying to atone for her time shaping and selling these creatures for public consumption. The animal rights angle never clicked for me. There are moments the film really tries, wanting you to shed a few tears for the fate of these gigantic creatures. Maybe you will, and there are a few shameless sequences to make you (the child sitting next to me was losing it at points). That’s why it’s not enough to have the bad guys have bad guy plans but they also have to be cruel and abusive in their treatment of the dinosaurs. The multi-million-dollar ploy to weaponize the dinos also baffled me. Are they going to be that much better than firepower? There’s a reason we don’t just drop hungry lions into our war zones. 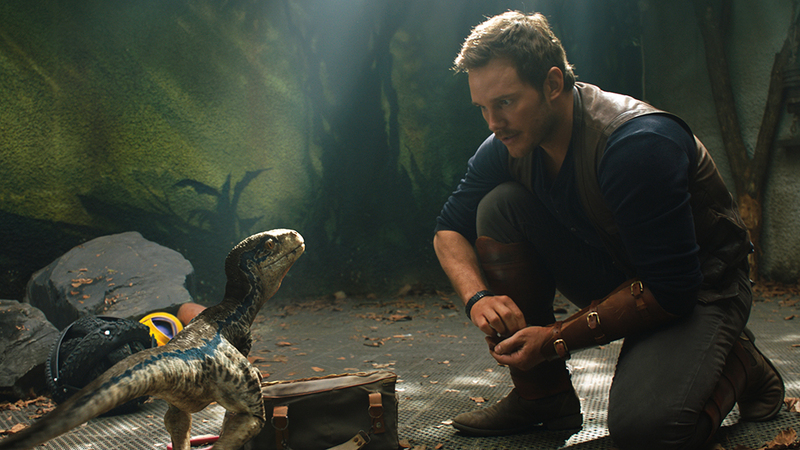 The new characters fail to add anything of merit to the story and larger Jurassic world. Cromwell’s Benjamin Lockwood is basically just a John Hammond stand-in (“Oh, there were TWO super rich dudes who funded the research and park now”). He’s confined to a bed for most of the movie and adds little besides his bank account. Then there are the two main team members, computer whiz Franklin Webb (Justice Smith) and med vet Zia Rodriguez (Daniella Pineda). He’s only here for comic relief and to do computer magic whenever called upon, and she’s only here for spiky attitude (she gets called a “nasty woman” for commentary?) and to do medical magic when called upon. Each of these characters is less a person than a handy plot resolution. When the movie transitions into its second half, both of them are kept on the sidelines. Then there’s little Maisie (Isabella Sermon) who has her own secret that really doesn’t come to much of anything and begs further examination. I suppose her perspective relates to a difficult moral choice at the end over the value of life, but she still felt underdeveloped. Even the villains are disappointing with the exception of Toby Jones (Atomic Blonde) as a slimy, one percent businessman looking for new thrills. I wish the screenplay had devoted more time to establishing the rich’s entitled sense of privilege even as it comes to a new world with living dinosaurs as the next big, commoditized play thing to buy and sell. With all that said, there are moments of enjoyment and excitement to be had with Fallen Kingdom. Director J.A. Bayona (A Monster Calls) has a great gift for finding the right image and holding onto it for maximum impact. He showcased this in his crafty, brooding, and highly effective ghost story The Orphanage and in his emotionally uplifting and harrowing tsunami survival drama The Impossible. With his first crack at a major studio movie, Bayona comes most alive in its second half when the movie transitions into a haunted house thriller in a mansion of secrets. His command of visuals and mood comes into sharper focus and there are some tense, delightful sequences. As much as I wrote about Fallen Kingdom being a movie of set pieces and little else, those set pieces are actually pretty entertaining. The island material only lasts about a half hour, wasting little time in getting the important pieces in play. There’s one long take inside a submerged capsule taking on water that keeps spinning and ratcheting up the tension that reminded me a bit of Alfonso Cuaron’s Children of Men. There’s another sequence involving a blood transfusion that I thought married comedy and tension better than anything else in the film, and it served a purpose that was credible. If you can shut off your brain and stuff your mouth with a steady supply of popcorn to thwart your incredulous grumbling, there might be enough to enjoy with Jurassic World: Fallen Kingdom. It’s technically well-made and the special effects are pretty good, the photography is evocative, and there are potent set pieces and imagery to stimulate the pulse. It’s loud, dumb fun, but for me, this time, the dumb outweighed the fun.